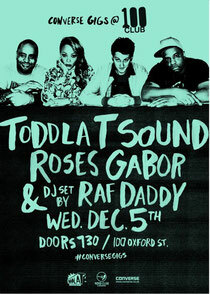 Converse Gigs @ 100 Club announced that The Toddla T Sound will take over the legendary club on Wednesday December 5. A widely respected DJ and producer, Tom Bell (AKA Toddla T) has officially released his brand new concept bridging the gap between his DJ sets and a full live show. Already road tested at various European festivals the response has been good! The Toddla T Sound features both elements of live performance and DJing with live vocalists, including Shola Ama, Serocee and MC DRS. For the first time, all material used in the set will come from the man himself, drawing upon his two albums to date, ‘Skanky Skanky’ and ‘Watch Me Dance’ and a heap of custom edits and remixes especially for the project. The show will also be augmented with the bespoke visuals of Sheffield designers, Peter and Paul. 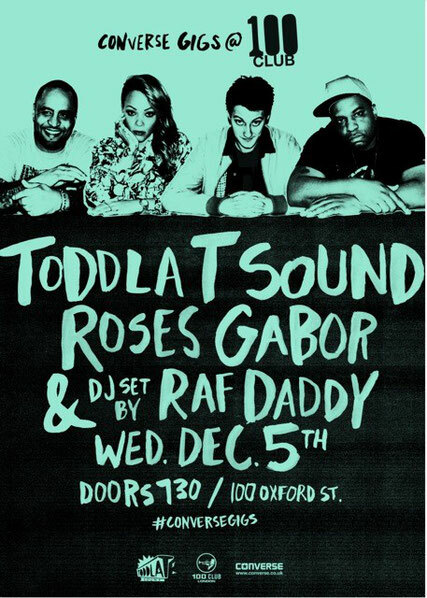 Support on the night comes from UK rising talent, Roses Gabor. Best known for lending her vocal talent to the likes of Gorillaz and SBTRKT; Roses is preparing for the release of her debut solo single ‘Stars’. DJ sets on the night from Raf Daddy of The 2 Bears. Tickets are free and if there are any left, you can get them exclusively via the Converse UK website www.converse.co.uk/conversegigs now.